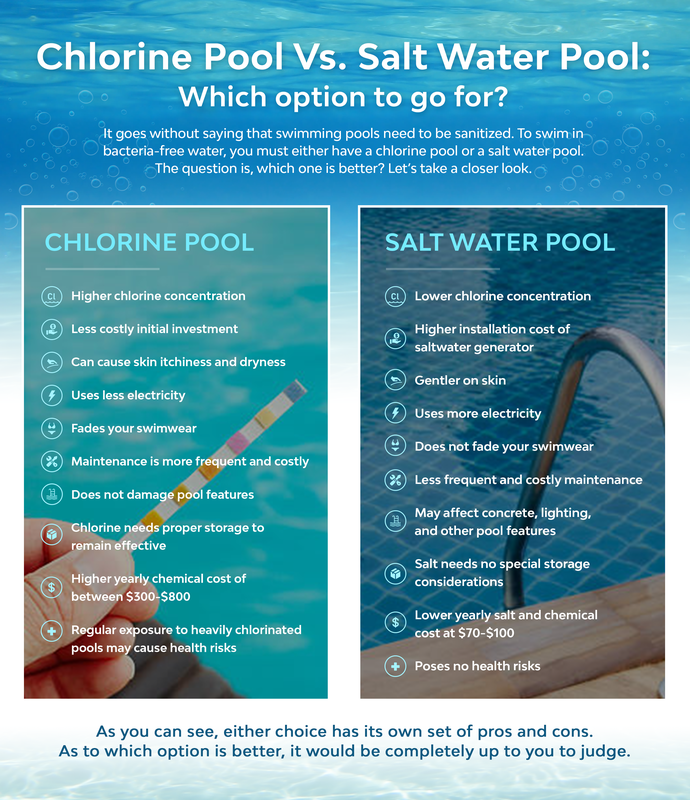 Deciding Between a Chlorine Pool or Salt Water Pool? Few things feel as good as going for a few laps in your pool. With trusty waterproof headphones plugged in and blasting your favorite music into your ears, you feel like you can go on for hours. However, the water in your pool may play a role in whether or not you can last that long. The water in a chlorinated pool, for example, can dry out your skin and make it feel itchy. Salt water pools, on the other hand, have a lower chlorine concentration and do not cause such dryness and itchiness. So if you want to keep on swimming for as long as you like, you should go for a saltwater pool. A salt water pool system also does not fade your swimwear, while the opposite is true of a chlorine treated pool which has a high concentration of chlorine chemicals. It also needs to be said that you may be exposed to health risks such as increased risk of heart disease, or even rectal and bladder cancer if you have prolonged exposure to the water of a heavily-chlorinated swimming pool. Nevertheless, chlorine pools have their own set of advantages over salt water pools. For one, a chlorinated pool requires a much smaller initial investment than a salt water pool. For another, a chlorine pool uses less electricity, which means lower bills for you. Eventually, the choice of whether to swim in a chlorine pool or salt water pool is yours. To learn more about the pros and cons of both types of pools, check out the above infographic. Whichever pool water system you choose – remember every pool needs a pool safety barrier. Which barrier is right for you?